The Romans and Greeks called the Celts ‘barbarians’. 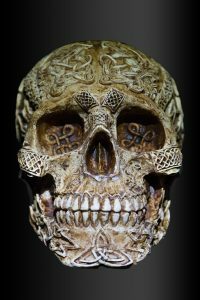 The Celts were a collection of tribes with origins in central Europe who were loosely tied together because of similar language, religious beliefs, traditions, and culture. The Gaels, Gauls, Britons, Irish and Gallations were all Celtic people. They were already in Britain by the 5th century B.C., and in Ireland by the 2nd. Although they were not centrally governed and consisted of diverse tribes that were quite happy to kill each other (! ), they maintained the same artistic tradition which is characterised by the use of distinctive flowing lines and forms. They also introduced iron working to the British Isles. The concept of a ‘Celtic’ people is somewhat of a modern romanticised idea. The ‘Celts’ themselves would probably define themselves slightly different to our understanding and definition of them today. And the Roman writings on the Celts was often a means of political propaganda. It was expedient for the Romans to paint the Celts as ‘barbarians’ and themselves as ‘civilised’ … not much has changed looking at our world leaders today… but I digress!!! The Celts lived in clans, who were loosely bound together into tribes. These tribes all had distinct social structures and customs, their own coinage and deities. They lived in huts that were gathered in hamlets. When they were not fighting, they were farming – and one of their contributions to Britain was the iron plough. Art was very important to the Celts, and they were also master storytellers. Bards and poets played a central role in passing culture and tradition to the next generation. The curious Druids were important to the Celts. They were a form of ‘super priest,’ who also became political advisors, teachers, and healers. They were revered and could interrupt a king as they held more authority. The druids also played an important part in the rich oral tradition. And the Celtic women? Well, you wouldn’t want to mess with them. Boudicca, King Prasutagas’ widow, did not take kindly to the Romans’ attempt at taking over Iceni lands when her husband died. She raised the Trinivantes tribe in revolt … and the Romans? … They were terrified. 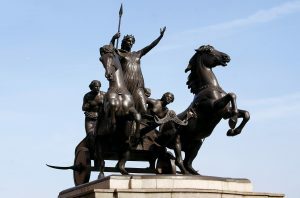 Boudicca provides an insight into the life of Celtic women – they could be war leaders, choose their own husbands, and own land. Very different from the treatment of women by other societies around them. The Celts loved a good fight. If there wasn’t one, they started one! As Diodorus points out, they took great care in ensuring their appearance would provoke fear in the hearts of their enemies. They took a liking to the heads of their enemies, which they considered had great spiritual powers. So they adorned themselves and their homes with their enemies’ heads as if they were Christmas ornaments. Christianity was introduced in Ireland around A.D. 431 with Pope Celestine sending out Palladius to some Irish believers (in all probability this community evolved through contact with Christians of Western Britain) as their first bishop. We often hear about the radical changes that Christianity and people like Palladius or Patrick brought to the Celts, but that is actually not the case. 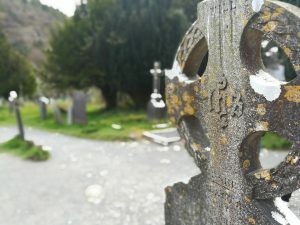 Celts and their sacred places and practices simply made room for Christianity. 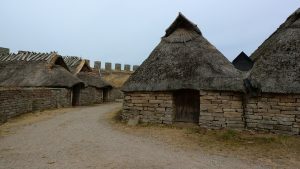 Many druids became Christian, and many of the churches and monasteries had some pre-Christian connection. The Celts were not ‘revolutionised’ by Christianity; instead, it was so readily accepted because there were so many similarities. 1. Their love and respect for nature and God’s creation. 2. Their love for hospitality and welcome. 3. Their recognition of women as equal. 4. Their spiritual disciplines that included solitude and service to the community. 5. Their love for art and poetry – illuminating the Gospel with their creative genius. In May 2019, Mark and I are planning to lead a group of people who are also interested in the story of the Celts through Ireland, Scotland, and England. We can’t wait. Maybe you’d like to join us? Please see this link for information. 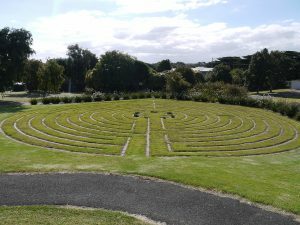 “Contemplative prayer is natural, unprogrammed; it is a perpetual openness to God so that in the openness God’s concerns can flow in and out of our minds as God wills.” Ray Simpson, from Exploring Celtic Spirituality. Last year I visited Elk, or Lyck as it was known to my family. 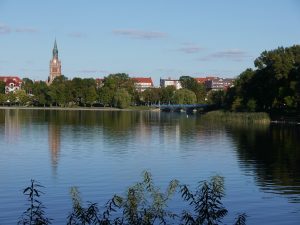 The town of my ancestors. I stood on the shores of the lake that held so many of my childhood fantasies. Fantasies that were fed by my grandmother’s mesmerising stories. 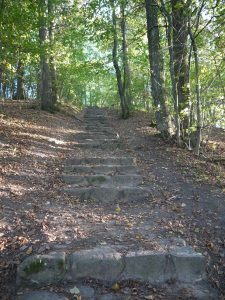 I walked through the vibrant forest, up a hill, overlooking that magical place of a thousand lakes. I could hear whispers from the past, a distinct sense of the closeness of another dimension. It hit me. I was again standing amidst a Thin Place. The Celts coined the term ‘Thin Place’ for spaces and moments where the distance between heaven and earth seems almost non-existent. There is a Celtic saying that heaven and earth are only three feet apart, but in the Thin Places the distance is even smaller. My guess would be that the first person to utter the term probably did so in an Irish brogue, as they stood in wonder, looking at the wind-swept isle of Iona or the rocky peaks of Croagh Patrick. Thin Places confuse our senses. We suddenly see the world in a different light. Our perceptions change. With breathless wonder we encounter the Divine and it changes us. 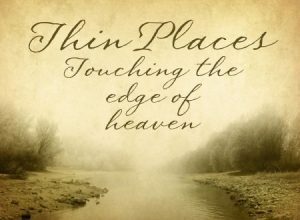 For people who hold to a faith, Thin Places are those places where we feel most strongly connected to God’s presence. And the light is not all on the other side. As I stood looking around by the lake at Elk, memories came flooding back. I was familiar with Thin Places. 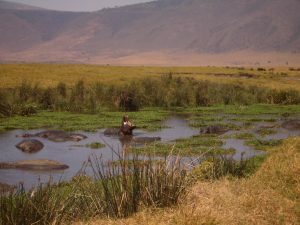 I remember the moment I stepped onto the edge of the Ngorongoro Crater in Tanzania, that holy hush that descends as all words fall short in the face of such beauty. Or as I watched the sea eagles swoop through pristine Norwegian fjords. I recall the Thin Place moment as I trudged through the dark, cold catacombs along the via Appia in Rome, sensing that I was surrounded by a great cloud of witnesses. And then there are those Thin Places of life and death. The moment when I took my newborn into my arms and marvelled at the wonder of life. Or when I held the hand of my dying mother on one warm and balmy December evening, and watched her pass over to another dimension filled with light. As I stand on the threshold of a new and different tomorrow, I also sense this is a Thin Place. I feel like the last few decades, lived in a blur of hurry and productivity, have given way to a rhythm of grace, and of seeing and hearing with an ever increasing sense of wonder. It has not been a comfortable place. I don’t think Thin Places are intended to be. Rather, it has been a place of irrevocable change of the way I view and relate to the world and who I am. What about you? Can you identify some Thin Places in your life? What was it about them that made them Thin Places? How are you different because of those moments? You only have one life to live and it’s not as long as we’d like to imagine. May you resist the temptation to live it in the way others expect of you. May you live deeply and not be asleep when the sun rises. May your very life be the sacrament of a Thin Place for you.